Musicals tell engaging stories through song and many are rich with economic concepts. 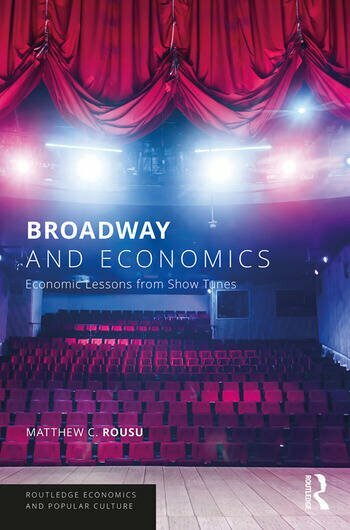 This book analyzes 161 songs from 90 musicals to explore what they can teach us about supply and demand, monetary policy and numerous other core economic concepts. While some songs have an obvious connection to economics, other connections may seem less apparent. When you hear "Let it Go" from Frozen, does your mind think about a firm’s production decisions? After reading this book, it will. Whether showing how Hamilton can illustrate concepts of central banking, or how "Stars" from Les Miserables provides a perfect example of inelastic demand, the author presents complicated topics in an understandable and entertaining way. Featuring classic songs from some of the most popular shows ever produced, along with some hidden gems, Broadway and Economics will be of interest to anybody studying an introductory economics course as well as theatre aficionados. Matthew C. Rousu is Professor of Economics at Susquehanna University, USA. He is a prolific researcher and frequently contributes to or is quoted by news outlets, including USA Today, The Washington Post, Bloomberg, and Forbes.